Motor ambulances are a rare luxury in Russia and the wounded are frequently two and three days in peasant's carts before they reach the railhead or base hospitals. This is a typical rear-guard trench, characteristic of the field fortifications of the great retreat. The last corps to leave Warsaw and one of the first in action on the southwestern front in the summer of 1916. Now that America has entered the world war and, in spirit if not by treaty, has become one of the Allies who are engaged in this incomparable conflict for the idea of world democracy, it becomes of fundamental importance that we, as a people, realize, and at once, the factors in this war with which and through which we must work in order that by our united effort we may consummate the sacrifice of blood and treasure by the achievement of an enduring peace in Europe and throughout the world. Of France, our traditional friend, we know much. Our realization of what England has done in the war is, for the first time, receiving the appreciation which is its due. Of far and distant Russia there seems to be apparently little known in America. The world is aware in a general way that the Russians have made huge sacrifices and have been fighting an uphill battle on the far eastern front. At this time, when we must in so large a measure depend on the coöperation and assistance of the great Republic, it is important that it should be realized exactly what Russia has contributed to the war and what her remaining in the war until the end means to the Allies, and to America in particular. For this reason I wish to trace briefly Russia's part in this conflict and what it has represented. To understand the almost insurmountable handicaps under which the Russians have been laboring, it is necessary to appreciate the nature and importance of the German influence in Russia, which for the last few decades has become such a vital menace to the independence of the Russian people. After the Franco-Prussian War, when the new economic and industrial era began to develop in the Teuton Empire, it was but natural that the Germans should look to Russia for their most important market. At first this outlet for their trade was a luxury to their economic development, but as, to a greater and greater extent, their trade became committed to this vast territory it became more and more of an economic necessity that they retain and increase their grip on Russia. The northern or Baltic provinces of Russia are very largely populated by persons of German blood who have for many generations been Russian subjects. It is natural that these people, in a measure, should feel and understand German aspirations and aid and abet in their plans where possible. By this I do not mean to assert that all Baltic Russians are pro-German, for some of the ablest and most loyal men and devoted troops have come from this part of Russia; but it is true that many of the worst influences have also been of Baltic province extraction. For ten years before the war we can trace the German influence moving through every specious channel of intrigue and malevolent activity to gain ascendency in the internal policies of the Russian Government. There is little reason to doubt that the German influence has aimed in every way to check the growth of liberalism in Russia. There are many who believe that but for the German influence there would have come the abolition of vodka five years before the war. The elimination of this curse would have meant education, and with education inevitably must have come a demand for a more liberal government and a ministry responsible to the Duma. Alone the Germans could not have hoped to exert this influence; but we find in Russia another group, commonly known as the bureaucracy, who had a community of interests with the Teutons. The bureaucracy represents the officeholders and officials appointed by the Throne, who have for generations, and one might almost say for centuries, preyed upon the resources of the Russian Empire, which, unchecked, have flown irresponsively through a small group of public buildings in the Russian capital. There has been during and before the war a coöperation between these two parties, the enduring prestige of which depended on German victory and Russian defeat. It is clear that if Germany had been overwhelmingly defeated, both the pro-Germans and the bureaucrats would have lost the hold they had on the Russian Empire. It is probably true that none of these dark forces had any great apprehension at the beginning of the war that Germany could lose; for, being well aware of Russia's unpreparedness, it seemed incredible that she could triumph over her enemy—efficient, complete, and ready for the war. Russia owes to the Grand Duke Nicholas Nicholaievitch the salvation of the Russian cause, for during the first six months, with the absolute power delegated to him by the Tsar, he completely upset the original military program of the Russian General Staff in Petrograd and of the Minister of War, Sukomlinov, afterward removed for corruption and alleged treachery. The original Russian program seems to have contemplated an early defensive. By a suspicious coincidence the German plan of campaign had anticipated the supposed negative campaign of the Russians and little effort had, therefore, been made for the defense of East Prussia, the greater part of German energy being directed toward the invasion of France. The Grand Duke, loyal to the cause of the Allies and faithful to the interests of Russia, in quick response to the appeals from France, upset, almost over night, the original defensive program and launched his East Prussian campaign. The Germans were probably taken by complete surprise as perhaps was the Russian Minister of War in Petrograd. The result of the Grand Duke's offensive in August, 1914, was to fill the Unter den Linden in Berlin with refugees fleeing panic stricken from East Prussia. It was impossible for the Kaiser to advertise, convincingly, successes in the west when every day filled the streets of the capital with refugees fleeing from the east. Ten days before the battle of the Marne the Germans transferred six army corps from the west to the east and Paris was saved. The Germans, utilizing to capacity their wonderful system of railroads, were able to make a concentration of troops in the east which almost annihilated the Russian army in East Prussia. The Russians accepted this disaster with extraordinary complacency on the ground that it was their contribution to the war, and that if they had saved Paris their losses were quite justified. Later in the fall, when the Germans were making their terrific drive on Calais, in their effort to strike more directly on England, the Grand Duke again launched a new and unexpected campaign on Germany, this time advancing from his base in Warsaw and striking at the enemy from the Polish frontier. Again the Germans were obliged to divert huge bodies of troops to meet this menace of the Russian invasion. By December 1 the Russians had been driven back to the Bzura line outside of Warsaw. It is true that they had suffered reverses, but it had taken sixteen German army corps to drive them back, and Calais was saved! In 1915, when the one cherished strategic aim of the Germans was to crush either England or France, their program was again upset, this time by the activity of the Russian armies in Galicia and the Bukovina. By the latter part of March the Russians had made such progress in the southwest as vitally to threaten the Hungarian plains, resulting in political chaos in Austria and Hungary. This became such a menace to the whole situation that the Germans were obliged to abandon whatever plans they had in the west and give their immediate attention to backing up the dual monarchy, lest it be seduced from its alliance. Beginning in May, the Germans began pouring their troops into Galicia, and for six months there was an unending flow of German divisions and of army corps directed against the Russian front with an extraordinary supply of munitions, while even in men the Russians were outnumbered at strategic points by two or three to one. The Germans were able to drive through Galicia and bring about the fall of Warsaw in August, 1915. Contrary to their expectations, they were unable to bring about an independent peace, and instead of seeing the collapse of their enemy they beheld the legions of the Tsar slip from out their grasp and retire into the vast spaces of the Empire. From August until October the great retreat continued, until exhaustion and falling morale of the invader made it necessary for the Germans to dig in for the winter. The Germans claimed that this was the appointed place that they had elected to reach for the winter, but I would state, unequivocally and without fear of contradiction, that the German advance stopped there, not because it wished to, but because it literally was unable to continue the invasion any farther. Any observer who has seen their lines as I have in many places would concur in the belief that no army would elect to spend the winter on a line which ran through forest, swamp, and plain, achieving, for the most part, no strategic asset. 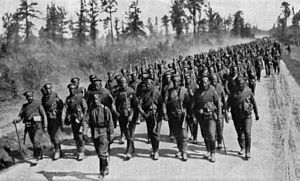 The world at large looked upon 1915 as a year of Russian defeat, failing to realize that it took between thirty-five and forty corps of German troops, operating in the east, to bring about the Russian disaster. The withdrawal of these corps from the west gave England and France an opportunity to prepare after the war what lack of vision had not done before. When the Germans, in the spring of 1916, sick of their empty advances in the wastes of Russia, attacked the French at Verdun they found them prepared, and their efforts, as the world now knows, to break the French line proved abortive. By June of 1916, when the Germans were assembling troops for some other strategic aim, Brusilloff launched his offensive on the southwestern front, which continued without intermission for seventy days. The capture, during the summer and early fall, of 456,000 prisoners and nearly 500 guns so demoralized the Austrians that whatever plan the Germans may have had for that summer had to be abandoned and supports hurried to Galicia and Volynia to save again the dual monarchy from collapse. This tremendous diversion of troops against the Russians last summer made it possible for the British and the French to commence their blows in the west on the Somme, operations which are still in progress. By September 1 Germany was again beginning to accumulate a strategic reserve which might have made it possible for her to strike either on the east or west. At this moment Roumania, dazzled by Russian successes, entered the war, and the Germans, again menaced on the east, were obliged to send thirty divisions to the Balkans to drive the Russians out of Roumania. We see, then, that ever since the beginning of the war the pressure of the Russians, directly and indirectly on the east, has robbed the Germans of their strategic opportunities on the west. Prior to the entrance of Roumania into the war the pro-German alliance in Petrograd had been viewing the situation with the gravest fear. For the first time it was beginning to see the great possibility of defeat. The Tsar, himself a well-meaning and patriotic man, was surrounded by a clique inimical to the Allies, eager to bring about a cessation of hostilities as the only means of preserving their power and prestige in Russia. The removal in the early summer of Sazanov, and every man in the foreign office known to be loyal to the Allies, provided a mechanism for negotiating an independent peace. The little clique who had been engineering this enterprise had been so intent on their own interests that they utterly failed to appreciate the fact that every other faction in Russia saw and clearly realized their aims. The fall of Bucharest gave them their opportunity, but so powerful had become the Duma and the Council of the Empire that the government dared not move openly at that time. Probably it was felt that the condition in Russia economically would be so desperate in the spring that the people would demand a cessation of the war and little intriguing would be necessary, but when spring arrived with its inevitable unrest, and the Emperor endeavored to dissolve the Duma, there came not the demand for an independent peace, but a demand for the overthrow of the government whose incompetence and double-dealing had brought about the wide-spread suffering and disorders in Russia. The ease with which this revolution was accomplished was due entirely to the fact that every faction in Russia realized the truth as to the government, learned by thirty months of observation of incompetence and munition shortage, which had resulted in the sacrifice of millions of men at the front, and made manifest at home by the fact that in Russia more than thirteen million refugees were forced to flee for safety to the heart of the Empire because an army had not been given rifles and munitions with which to guard the Russian front. We now approach the period of the present, when America has elected to enter the world war, and if America would realize what Russia means to this cause it must understand that the Russians at the present time are holding on their eastern front, from the Baltic to the Danube, nearly three million enemy troops, perhaps a million and a half of these being Germans. If, by disaster at the front or by intrigue at home, Russia is forced out of the war during the coming summer, we may anticipate the early transfer of a large portion of this vast mass of men to the western front, and we will see the beginning of what in reality is an entirely new war. We must now consider what is our duty toward ourselves and toward our Allies. The minute a nation by declaration of war engages in hostilities with an enemy nation it becomes the duty of the government and the people of that government to commence striking at that enemy with every means which is at its disposal—moral, financial, economic, and military. If this country is to be of actual and vital assistance to the Allies who are fighting this war for world democracy and the cause of humanity against the German Government, which represents neither, the first and most essential requirement today in America is the realization on the part of the people of this country that the Germans are not on the point of collapse. I have been in three countries at the beginning of the war—England, Russia, and Roumania—and in each of these countries the seeds of future disaster, later paid for by the sacrifice of hundreds of thousands of lives, were sown in the belief among the people that the struggle was to be of an approximately short duration, and that it would be unnecessary to exert the entire national effort to defeat the enemy. I heard many Englishmen in the early days of the war express their hesitancy in enlisting for a year's training before going to the front, because they believed the conflict would be over before they ever could reach the fighting line. In the fall of 1914 the Russian Minister of War had almost ceased ordering ammunition, expressing the opinion that the war would be over before the time of delivery came, while in December of that first year men of highest importance in the Russian Empire labored under the belief that Austria, exhausted by her early sacrifices, was on the point of making an independent peace. Roumania, in September of 1916, believed that the war was practically over. The result of this general misconception in England was that the mobilization of British resources did not take place until the spring of 1915 and conscription until 1916. In Russia the truth was realized only when the army ran out of supplies early in 1915, when she paid for the lack of vision of her government by the sacrifice of thousands of lives in the great retreat, while Roumania, as the world now knows, has lost three-quarters of her territory as a price for her undue optimism as to the German capacity to continue the war. In 1917 we hear in America the same fallacious arguments that one has heard for three years in Europe, namely, that Germany is at the end of her resources, and that it is not worth while for individuals to enlist, as the chances are they will never have the opportunity to leave American shores. The prevalence of this opinion is in reality of the greatest assistance to the Germans, and by the wide-spread belief in this we are actually making the duration of the war infinitely longer. To those who believe that the German Government is about to break on account of the reverse on the western front, I would call attention to the extraordinary psychology of the German people, which is so different from that of all other countries engaged in this war that comparison is impossible. It is difficult for Americans to realize the discipline and lack of intellectual initiative which exists in the German army and among the German people. Ever since he became Emperor, Wilhelm has been instilling his extraordinary beliefs into his army and into his people, until today we have a psychology in the Teuton Empire which will probably make it possible for the military autocracy to continue the war to a far greater length than would be conceivable in any other country in the world. With such ideas as these being instilled into the German army and German people year by year, we must not believe that at the first sign of reverse they will forget the teachings of forty years and demand consummation of immediate peace; and we must likewise realize that a revolution in Germany at this time has far less opportunity for success, for there is every probability that the German soldiers would fire upon their own people with the same subservience to their officers that they show in all their military operations. While the military operations in the west are of vast importance to the situation and must unquestionably demoralize the Germans to a certain extent, I see no reason to believe that the events of this month in France have created a condition from which we may expect any immediate results looking toward peace. When we read that the French and English have taken 33,000 prisoners and 330 guns in the month of April, we must, of course, rejoice; but we must at the same time guard against an optimism which leads to the belief that our only duty in this war is financial and economic. These losses of the Germans, while encouraging, are in reality but a drop in the bucket. It might be well to remember that Brusilloff, in a little over two months' operations on the southwestern front in Russia during the summer of 1916, took 450,000 prisoners and 496 guns; and yet this far greater loss to the enemy, as one now realizes, has exerted but transitory influence on the world situation. In order fully to appreciate the Teuton strength, it is necessary to give the Germans the credit which is their due. One must, I think, consider broadly their whole point of view and realize that the power of the Central Empire, and no one at this time will question its strength, is due to the German virtues and not to the German vices. Now that the bitterness against the Germans is so intense, it is difficult to wipe away the prejudices one feels and give them the benefit of the extraordinary values which they have as a people; but if we underestimate these virtues, we fail to understand the causes which have made it possible for the Germans to do what they have done. Much as I disapprove of the German point of view and of the spirit which has been manifested by the Germans of nearly all classes in this war, I still remain of the opinion that, taken from the internal point of view, our enemies possess almost every virtue which makes for military strength. With this idea dominant in the German mind, and probably now accepted as a truth even by the Kaiser himself, who has come to believe implicitly in his own statements, the fallacies of which his lack of imagination has made him incapable of seeing, there has been produced in Germany a national fortitude and a capacity for sacrifice rarely equaled and never surpassed in the history of the world. Having spent in the achievement of what they regard as their national defensive aims four and one-half million casualties gross, we need not imagine that the loss of a few hundred thousand in the west is going to exert any fundamental or far-reaching influence on the German ultimate capacity of resistance. I believe it to be an absolute truth that if America prepares for war with the idea that this conflict is to last for three years we may expect the end of the war before 1918; but if we elect to make the same psychological mistake that the other Powers have made and cling to the belief that the war is almost over, and prepare in the belief that the Germans will be exhausted this year, it is perfectly possible that the war may last for another two years. If we raise a trifling army of half a million to a million men, it is quite possible that before this war is over we may suffer a million casualties on the western front alone; whereas if we accept the necessity of sacrifice and prepare ourselves as we would do were we fighting Germany alone and for our national existence, and formulate plans for a three-years war, involving ultimate capacity to deliver on various European fronts five million men, fully equipped and trained, it is my opinion that, with the possible exception of an expeditionary force for moral effect on the situation, none would ever reach a European front. It must be realized at this time that a dominant feature in the world has become the visible supply of man power. The German staff has carefully analyzed the European situation, has reckoned with this visible supply in Russia, France, and England, and has, to its own satisfaction, reached the conclusion that Germany has a sporting chance of outliving her enemies in this competition of death. The staff has not, at any time, I am certain, included in its figures the possibility of five million Americans being potentially available to fill the losses of the Allies in 1918, 1919, and possibly 1920. In this matter of the visible supply of human material I see a direct analogy in the wheat market. If a Chicago operator contemplates a corner in May or July wheat and learns many months before that the acreage in Argentina is to be increased 200 per cent, his plans are affected and defeated, not when this wheat really comes on the Chicago market, but when he receives information of the contemplated acreage in distant fields of production. Thus the price of wheat in other ruling markets is affected even before a seed is planted. And so, I believe, it is with this military situation. If our plans contemplate the raising of an army of five million men within a certain period, the Germans feel the military and moral effect before we have enlisted the men; for it means that a staff already desperately pressed to provide men for this year's campaign must extend its vision to contemplate the possibility of raising in 1918, for delivery at the same time and place, approximately an equivalent number of troops as contemplated in our military program. The realization of this potential situation must convince the enemy that what they cannot accomplish during this summer they can never accomplish, and the necessity of peace late in the fall or early winter must be apparent to even the frozen imagination of the German people. It is for this reason that I believe our second fundamental duty is the adoption of a military program on the basis of three years of war. The third fundamental and, in my opinion, the most necessary action which this country should take is that which our President and government are already taking in the support of the new provisional government in Russia. Inasmuch as we cannot at present strike the enemy with any military force of our own, we must strike by assisting, to the greatest extent possible, that member of the Allies who is in the greatest need of assistance. It must be evident now that the Germans have lost for the present the possibility of achieving any objective in the west which might bring them peace. It is clear, then, that they must turn their minds toward the adjustment of peace with Russia; for, if this end can be obtained, between two and three million available troops would be released for operations in the west, and an access to food supplies and raw materials in Russia would largely neutralize the effectiveness of the British blockade and give the Germans the capacity to fight indefinitely. While I am not a pessimist as to the situation in Russia, I am certainly of the opinion that it is more than a military possibility for the Germans to take Petrograd between now and the first of September. Were they to do this, they would strike a terrific moral blow at the Empire and all equally heavy economic one by the capture of the greatest munition and manufacturing base in Russia. At the same time they would isolate the Russian fleet in the Baltic and threaten potentially the lines of communication between England and Russia, throwing a terrific burden on the Trans-Siberian Railroad. There is no question but that the present provisional government in Russia is composed of the most far-seeing and patriotic men of the nation. Perhaps no revolution in history has produced a finer group of patriots than this Russian twelve; but we in America must not expect the impossible, even from these distinguished and highly intelligent gentlemen. In the face of military disaster, the possibility of which we must recognize, and the loss of the capital, whose security we must not too certainly depend upon, and with the ammunition and supplies from the outside threatened, if not cut off, we must discount the possibility of all extremely dangerous situation in the east during the coming summer. We must always count on German intrigue exerting malevolent influence in Russia whenever the news from the front is in the least bit pessimistic. It is for the reason mentioned above that I believe our President has shown great wisdom and foresight in giving his immediate attention to the Russian situation in preference to any other of the Allies at the present time. As to the ultimate outcome of the war there is, of course, not the slightest doubt in my mind, nor has there ever been. The only danger was as to whether or not Germany's material preparations would be able to crush the Allies before the character of their people had had time to crystallize and prepare itself first for defense and then for offensive operations. With nations as with individuals, it is character that is the ultimate test. Forty-two centimeter guns are worn out, munitions are shot away, and food supplies are eaten up, but the moral character of the people remains the one enduring asset which makes sacrifice possible and victory assured. The American Revolution was won, not at Yorktown, but at Lexington, when it became apparent for the first time what was the fiber of the American people; and so this war was won when it became evident that the people of France, of England, and of Russia preferred sacrifice and death to defeat. That all these sacrifices are justified those who have followed the situation closely cannot doubt. I am personally of the opinion that an enduring moral idea is the greatest inheritance which one generation can leave to its successor. The establishment of the democratic idea, based on morals, ethics, equity, and justice, which must come from this war, is worth, not a million or ten million casualties, but fifty million, if from this struggle there emerge an enduring conception as to the fundamental basis on which society, progress, and civilization must rest in perpetuity. Source: Stanley Washburn (April 1917), “The Russian Situation and Its Significance to America”, The National Geographic Magazine 31(4): 371–382.